Revenants is a novel that confounded my expectations. Set deep in the woods of 17th century New England, it tells of Cold Marsh, a village founded by a religious community, one whose members have been responsible for some dark deeds, and one whose young women have been going missing. Given the setting, the plot, and the subtitle – A Dream of New England – one might expect tortured, knotty, overlong sentences and endless streams of adjectives, but in fact this book features some of the cleanest, clearest prose you could find, with few words wasted, the narrator almost as terse as his buttoned down characters. It's written in the present tense; that's been done before, many times, but it was a clever choice for this story; flashbacks to earlier events slip naturally into the past tense. This makes for a marvellously readable text; I've read few books that felt quite so polished. The author has a degree in Environmental Science, and the environment plays a huge role in this novel. The villagers have cleared their space in which to live and build, and plan to expand, but fear the surrounding woods, fear the ghosts of those who once lived there. So one might expect lengthy, dull descriptions of trees and nature. But no: there are descriptions, but somehow they never bore, perhaps because they do not present nature as a still life: "The grass is matted underfoot, stitched by frost into yellow beds that crackle like straw." Even when the novel stops to smell the flowers, the book is still in motion. It is a novel about religious zealots and their repression, of themselves and others; Isiah Bellringer is the great-grandson of a witch finder. Young women, strange behaviour, rumours of witchcraft: one might think the ending easy to predict, but once again the novel surprises. The plot drives these poor characters on, and the sense of fate unleashed is tangible, but it's a novel that never goes quite where you'd expect. Sometimes, the book seems to reflect, belief in fate is just a way of excusing our failure to act against it. This was one of my favourite books of the year so far. From any author this would be a notable book; for a first novel it's quite remarkable. 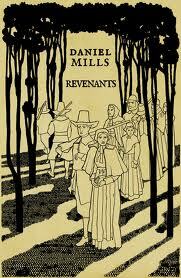 Revenants by Daniel Mills. Chômu Press, pb, 294pp. Amazon US . Amazon UK. Reviewed from print ARC. Note that we published a story by Daniel Mills in TQF36, The Photographer's Tale. Books received: March, April and May!